Linton Hopkins's secret for making his sweet strawberry preserves is simple: Use ripe berries, and cook them at the proper temperature so you don't have to add any fruit pectin as a thickener. 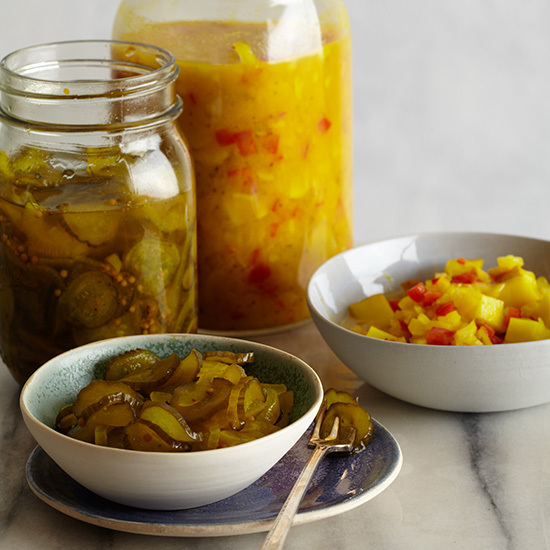 Chowchow, a slightly tangy Southern vegetable relish, is terrific with everything from hot dogs to corn bread, and is a perfect way to preserve summer produce like bell peppers and green tomatoes. The trick to canning peaches is packing the peach halves tightly without squashing them; a full jar is prettiest. This recipe is an excellent way to use up sweet summer cherries. Use these to make a supersummery quick marinara sauce. Swap this for maple syrup when making pancakes or use it as a flavoring for homemade ice cream.